The axe has finally fallen on South Korea's once mighty Hanjin Shipping, with a court in Seoul declaring it bankrupt. The firm was once the seventh-largest of its kind globally, but suffered from sluggish global trade. A regional court in Seoul on Friday officially declared Hanjin Shipping bankrupt, ushering in the final chapter for the South Korean shipping company, which had struggled for years under the weight of billions of dollars worth of debt. Hanjin filed for bankruptcy protection in August of last year, owing $5.37 billion (5.03 billion euros) as creditors refused to bail it out. 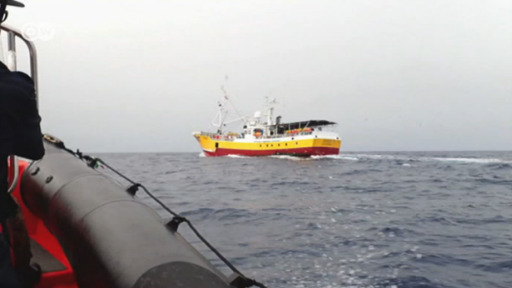 As a result, dozens of vessels were left stranded around the world as they were refused entry to ports. An accounting firm hired by the Seoul court concluded earlier this year that the firm's liquidation value would be greater than its worth as a going concern. Hanjin was once South Korea's biggest shipping company and the seventh-largest in the world. It has since been forced to sell most of its assets at home and abroad to pay off debts, with more than 1,500 employees laid off in the process. "We will try to ensure that the bankruptcy process will enable the firm to pay off debts to all debt holders in a fair and proper fashion," the court said in a statement. Trading in the firm's Seoul-listed shares was halted on Friday. Hanjin Shipping started going under after the industry suffered its worst downturn in six decades caused by slumping global trade. Mismanagement by top executives was also blamed for the company's collapse. G8 countries cancelled the debts of 18 African countries in 2005. But many of these countries now face bankruptcy again. Is China really to blame, as many in the West believe? Its headquarters was once the tallest building in the world, but Sears’ heyday is now far in the rearview mirror as it files for bankruptcy. The rise of e-commerce has hastened its demise and its future is uncertain.